After a period of relentless rain and wind, much of the Northwest will experience a wonderful break, with several days of dry conditions, sunny skies, and light winds. And to add to the experience, sunset is now perceptibly later. This morning's sunrise says it all. But if you really want to be optimistic, here is the forecast accumulated precipitation through 4 PM Tuesday from the UW WRF modeling system. Washington and Oregon are dry, in contrast to a sodden California. But can you trust this forecast? Let's check the NWS/NOAA GEFS ensemble system (running the model many times to explore uncertainty) for Seattle accumulated precipitation (see below). Yes....all the members of the ensemble are dry through 4 PM on Tuesday. You can take this forecast to the bank. What about sun? Expect a lot of it. Here is the cloud forecast for Sunday at 1 PM. Cloud-free conditions are predicted. Why will the northwest have such a nice break? Because of major ridging (building of high pressure) over the western U.S. with the jet stream (and associated storms) heading into California. Let me show you with a series of upper-level (500 hPa pressure, about 18,000 ft above sea level) charts to illustrate. 7 AM today. A ridge centered to the east of us, with a trough offshore that could bring a sprinkle to the coast, but not much more. 4 PM Sunday. Wow.. huge ridge builds over our region. Monday at 4 PM...still there. And at 10 AM Tuesday, the ridge is starting to pull back, but still enough to keep us dry and sunny. You might notice that a lot of action is going into California. While we are dry, they are going to get pummeled with heavy rain and wind. Take a look at the 7 day forecast precipitation totals for southern CA from the European Center model. Some amazing totals (as much as 10 inches in the mountains there). There won't be much drought talk when this is over. This situation is classic El Nino, with the jet stream heading into southern CA. 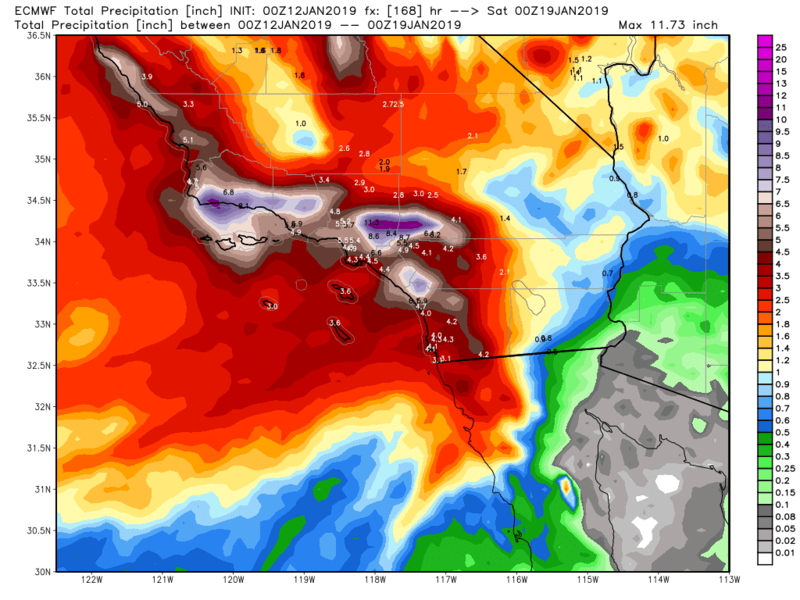 So if you were planning a trip to LA to dry out...cancel it. Stay here for sun and dry conditions. A break like this in mid-winter is a godsend for those bothered by darkness and clouds. And keep in mind that our meteorological spring is only 5 weeks away. I was raised in a Hutterite colony. A religious sect from the reformation era that practices communal living where everybody eats together and they are very primitive and have no radio or television, my parents used to have a barometer on the wall It was manual and it had one hand that you could align with the barometer pointer and that would give you the ability to gauge its movement up or down, my parents marinating in idleness from not having any connections to the outside world would watch that thing, “oh it’s going down it’s going to rain”. Or. “ there is no moisture happening folks, it’s way up these days”. Lets drink a cuppa coffee and take another look at it shall we? Funny and beautifully written. Are you an author? This is an atypical Fall and Winter. Very little rain and wind in November (rain only in the last days of he month) with fall storms in November and January. It has been very warm here in Whatcom County (that's what our plants are telling us). Cliff, I truly appreciate the fact that you don't seem to take pleasure in only reporting scary and ominous forecasts. For that reason, among others, you're my go-to weather guy! Thanks for the good weather news!! Mr. Mass, why does this kind of unseasonable weather make you so happy? It's January. We live in the PNW. It's 56 and sunny and completely still outside- this is the blonde cheerleader of weather. It's boring, it's tedious, it's completely lacking in any character whatsoever (apologies to blond cheerleaders, I'm sure there are lots of fascinating ones out there). It's tourist weather (I'm in the San Juans and trust me, the vast majority of the tourists here just want the picture postcard experience, for whatever reason). Weather for people who lack imagination. People who should live in LA (which is where I grew up, no thank you). I hate this weather; it's SAD, but I get it when it's too sunny. This weather is hideous and bad for our plants. You should try Southern California, if this is what you really enjoy. I'm with Heather. These sort of days here in the Willamette Valley often lead to air stagnation alerts. Given how low the pond is on our property I am happy for any rain we get. The closest National Weather Service reporting total to here, Eugene, is down 10" on the rain year; Salem is down 6". Some of us in the Pacific NW are not as fortunate as Seattle. There is no such thing as too much sun, especially in the winter when the sun that is present isn't really warming the air to uncomfortable temperatures. We had that nice sunny streak back in October and the sun just made the fall colors "pop" with much more contrast than the uniform dullness of color under overcast skies. The real bummer is that the weather doesn't stay like this all winter long. Ah, but Heather, what is better than a lovely break from the same old cloudy, windy, rainy. As much as I love PNW winters, this kind of oasis of clear skies in mid-Winter is so welcome. Time to sit out on the deck under blankets at night and enjoy the stars. Time to go hiking along trails that tourists (and all but a tiny handful of locals) have long disappeared from. My Labs don't want to come into the house. Some people fly to Hawaii for a mid-winter break, but this year it has come to us. And besides, Vitamin D from sun on pale skin is way better than the stuff that comes in bottles. Hi Cliff-you mentioned this a classic El Nino pattern. Although the 500mb flow is what one would expect for El Nino, CPC has not declared it official or other groups for that matter. I guess it is not just the sst, but overall flow pattern? ENSO neutral conditions are present, but we have a 65% chance of being told (sometime in April) that an El Niño officially started in October. Does that clear things up? (Sarc). I'm another in Heather's camp. I love sun & warm, in its proper time & place. Not in January, in this corner of the world. Anyway, mid-50s is relative. I'd go elsewhere for a genuine dose warmth & sunshine. Here in my native backyard, I'm content to sink in to the starkness & beauty of gray winter, with its own unique offerings. As an aside, our weather of late hasn't impressed me at all as "relentless rain". Just seems like the norm, or perhaps even less so in that winter's been on the rather mild side. Funny how blithely you were able to characterize weather that's "completely lacking in any character whatsoever". Irrespective of your other, admittedly vivid, descriptors, even depicting the weather as lacking in character (which, of course, is nonsense) is still a characterization. Nice job simultaneously contradicting the point you attempted to make. Perhaps your California upbringing somehow pathologized you with regard to your enjoyment of weather...or perhaps even life itself. You do come across as a tad bitter in your above comment. "The real bummer is that the weather doesn't stay like this all winter long." It always strikes me as so odd when someone says they want the climate to be different that it is. The thought is so irrational it makes my head spin. Stop and think for a minute about what makes climate. November saw massive amounts of rain a few miles north of you in the north shore mountains of Vancouver. November 2018 had more sunshine and dry days than normal but enough deluges and 1-2 day heavy rain events that made it a wetter than normal month at least just north of the border. Hi Cliff or anyone familiar - are the weather observations at the Mt. Rainier Paradise weather station still being done? I'm not sure how they could be, if the road is not being plowed. Thanks! The weather has been plenty interesting, only it has not been interesting everywhere. Thanks, Micro-climates! Windstorms, a tornado, some folks did see some lower elevation snow. Other spots, thanks to mountain shadowing, this rainy season will rightfully earn a description of being "dull". Given all the "Interesting" life itself dishes out independent of the weather, the weather being dull is just fine for most people. I personally can't call what we have here "winter". Constantly in the mid 50's all season is not "winter'. Hitting 61 degrees in January is NOT winter. Rainy season and Dry season is what this area has, at least in the lowlands. Its the same general Mediterranean climate as Los Angeles, only LA has the "Hot Summer" variant. If you want "real" seasons, you have to move east. While the MSM is already characterizing this solely as the failure of a negligent utility, the malfeasance cuts both ways. When you keep electing ideologues rather than pragmatists to run your local government's infrastructure, this is the inevitable result. The near - catastrophic damn failure in CA was just more grist for the mill. Take a drive around my town and you'll see potholes everywhere and traffic signs that are hanging by a thread, different locale, same result. 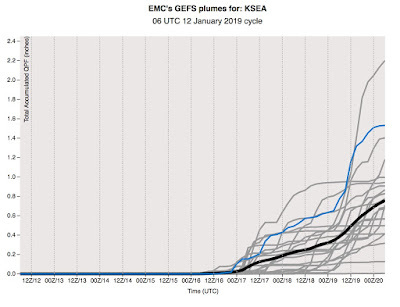 In some of your previous blog posts, you commented on the need for more computing resources in weather modeling. As a computer programmer who also studied weather modeling, I would like to bring attention to a recent revolution in computing hardware especially the Google TPU (tensor processing unit). This revolution began when Nvidia started producing custom chip sets for gaming computers, the GPU (graphical processing unit). The AI research people soon realized that the GPU could enable much larger neural network models (NNM). The GPU lead to major advances in NNMs such as an NNM which readily beat the world champion Chess and Go players by only studying actual games for several hours. More recently Google has improved the GPU and started selling their custom chip as the TPU (tensor processing unit).The TPU decreased computing time in NNMs by 10-50 orders of magnitude! Current NNMs have in excess of 600,000 nodes. All nodes in a network are interconnected and apply the same or a similar complex set of mathematical functions to their input data. The analogy to weather models, each station being analogous to a NNM node, should be apparent. I suggest a work station equipped with TPUs may have computing power comparable to a supercomputer when running a weather model! Ask your computer savvy colleagues what they think of using TPUs to run weather models locally. It was a big deal for us chess players when in 1997 a computer beat world champion Gary Kasparov. What you're talking about is different, like something out of a science fiction thriller. Scary! "All of that has changed with the rise of machine learning. By playing against itself and updating its neural network as it learned from experience, AlphaZero discovered the principles of chess on its own and quickly became the best player ever. Not only could it have easily defeated all the strongest human masters — it didn’t even bother to try — it crushed Stockfish, the reigning computer world champion of chess. In a hundred-game match against a truly formidable engine, AlphaZero scored twenty-eight wins and seventy-two draws. It didn’t lose a single game. Most unnerving was that AlphaZero seemed to express insight. It played like no computer ever has, intuitively and beautifully, with a romantic, attacking style. It played gambits and took risks. In some games it paralyzed Stockfish and toyed with it." You’re right, you’re seeing far more out there than I am! All I see is stasis. I wish I could see it like you do, since there’s nothing to be done about it. I can’t agree, John! I like windy, rainy, cloudy, cold. It’s a big part of why I moved up here. A few years ago a lot of my spring plants and fruit trees flowered early due to the heat- then they all died in April, and the fruit harvest that year was terrible. I like seasons! Wow, a sweeping condemnation of my character based on a short comment in a blog post. We’ll clearly have to agree to disagree. "Wow, a sweeping condemnation of my character based on a short comment in a blog post. We’ll clearly have to agree to disagree." Try not to take it personally (easy for me to say considering I was not the target). I think I took your tongue-in-cheek post in the spirit you intended, so your character is intact as far as I am concerned. Considering that stretches of mild, sunny weather occur pretty much every winter (and occasionally multiple times) I think it's fair to include them as being part of the climate. They're certainly more commonplace than stretches of prolonged cold and snow, so if it's irrational to like the best weather winter can offer, it's even more irrational for people to wish for more lowland snow. Also, for the people who are quick to deride sunny and dry weather as boring...how many are doing so from inside the house? There is no better time to get outside and enjoy an adventure than when the weather is nice and dry. There's so much scenery and nature here that it's a shame people can't get out and enjoy it to the fullest extent.